©1999-2019 F. Dörenberg, unless stated otherwise. All rights reserved worldwide. No part of this publication may be used without permission from the author. It is always good to have a "station monitor" to check the modulation of my transmitter output. I already have a nice digital oscilloscope, so all that I need is an attenuator or an attenuating coupler. As usual, I had to decide on "make vs. buy". 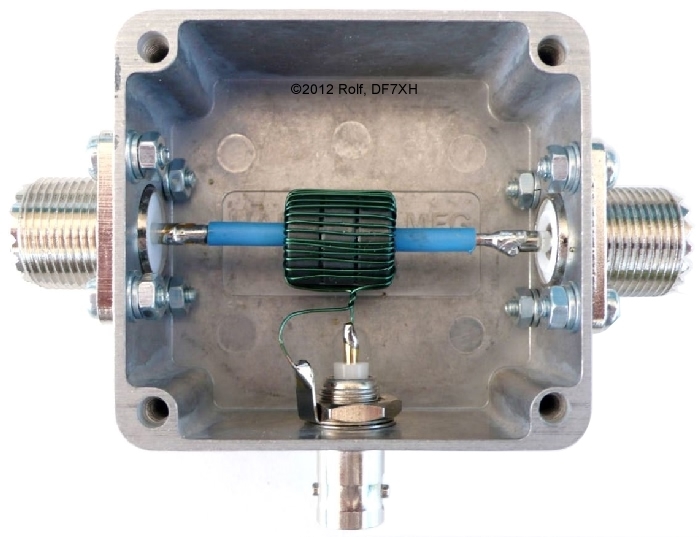 Simple directional couplers are available as a kit, e.g., the Elecraft CP1 dual directional coupler mini-module (25/250 W, -20/-30dB, $40 mid-2015 pricing). The CP1 is actually 2 directional couplers - one for forward power, one for reflected. I'm not interested in building an SWR meter, so I actually only need an attenuator/coupler. The builder's manual of the CP1 (ref. 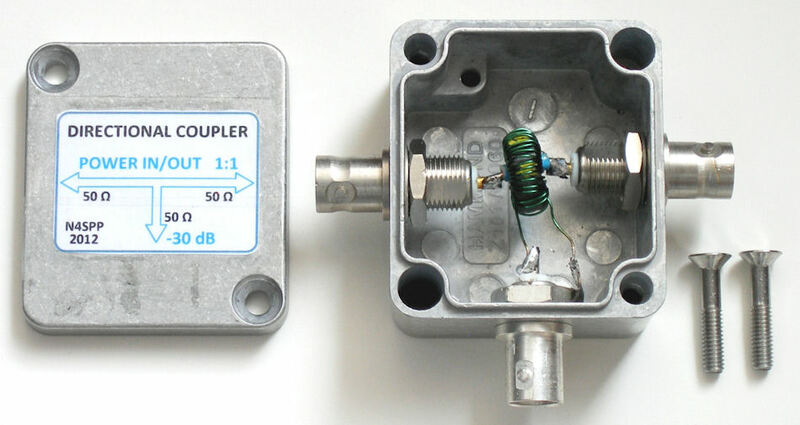 1) provides all the info required to make your own -20 dB or -30 dB coupler. I have a 100 W transceiver, so I decided to build a -30 dB coupler. 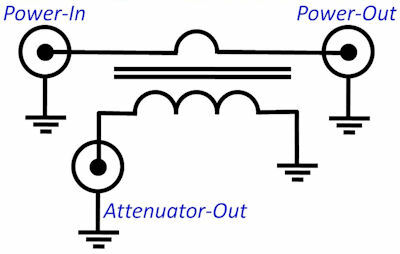 An attenuator/coupler is a 3-port device: power-in, power-out, attenuator-out. Ideally, for all frequencies of interest, the ratio of power-in to power-out is 1:1. That is: 0 dB damping. Typically a power-in to attenuator-out transformation ratio of 100:1 or 1000:1 is chosen. That is: 20 dB or 30 dB damping. In other words: 100 W at the input appears as 1 W (-20 dB) or 100 mW (-30 dB) at the attenuator output, when terminated with 50 ohms. Besides looking at the attenuator output with an oscilloscope, it can also be fed to a simple diode RF detector and a Digital Volt Meter (DVM) for RF current measurements (ref. 5) or a QRP wattmeter. Note that the termination-impedance at the attenuator output-port is transformed to an impedance that is in series with the 1:1 power-in to power-out path. This transformation ratio is the inverse of the power-in to attenuator-out ratio. That is, a 50 ohm load at the attenuator output port appears as a 0.5 or 0.05 ohm series resistance (for 20 dB and 30 dB attenuation, respectively). For normal applications, this is insignificant. Note that all ports - even if not used - need to be terminated with a 50 ohm load! For instance, if the attenuator-output is left "open", then a high series impedance is reflected to the forward power path! If we are not interested in the direction (forward vs. reflected), then such a coupler is a symmetrical device, and power input & output can be swapped. Based on the CP1 manual (ref. 1), all that is needed for a -30 dB coupler is a small ferrite ring and enough thin magwire (enameled copper wire) to make 30 turns. The primary winding is just a short piece of heavy insulated copper wire. Note that this primary winding passes straight through the ferrite ring once, not twice! Each time the wire is passed through the ring, counts as a turn. The required number of secondary turns is simply the square root of the transformation ratio: 30 dB = 103 : 1 = 1000 : 1, and SQRT(1000) = 31.6. So actually 31 or 32 turns should be used in this coupler. A 20 dB coupler would have SQRT( 102 ) = 10 turns. A 10 dB coupler would have SQRT( 101 ) = 3.16 turns, but we make whole turns: 3.
see ref. 3 for which one to choose! power handling can be increased 4x or 9x by stacking 2 or 3 ferrite rings. As in the CP1, I used wire with 0.4 mm Ø (#26 AWG); other thin insulated wire, such as the "wire-wrap" variety, should also work. 1 short piece of heavy-duty copper household installation wire (I used solid wire with 1.5 mm Ø). 3 chassis jacks, e.g., female BNC, SO-239, or "N"
Yes, I could have added some more secondary turns to get (even) closer to 30 dB on all frequencies. But 3% is close enough! Ref. 1: "Elecraft CP1 Dual Directional Coupler", Rev. A, Elecraft, September 2005, 3 pp.